This week we’re learning about Papyrus, a yarn made with strands of cotton and silk, twisted together, then twisted together again. I was so intrigued by its construction in my previous post, I forgot to talk about the color range! A sampling of the summery shades of Papyrus: Elderberry is the dusty mauve, Camellia is the bright pink, Daffodil yellow, and Gardenia is a soft, milky white. Papyrus comes in 22 colors. Raven and Bison are the darkest shades, and Camellia is the brightest. The rest of the shades are very soft, perfect for summer wear. The names of the colors evoke mental pictures of the shade: cloud, moonstruck, doe, and water lily need very little more in the way of description. 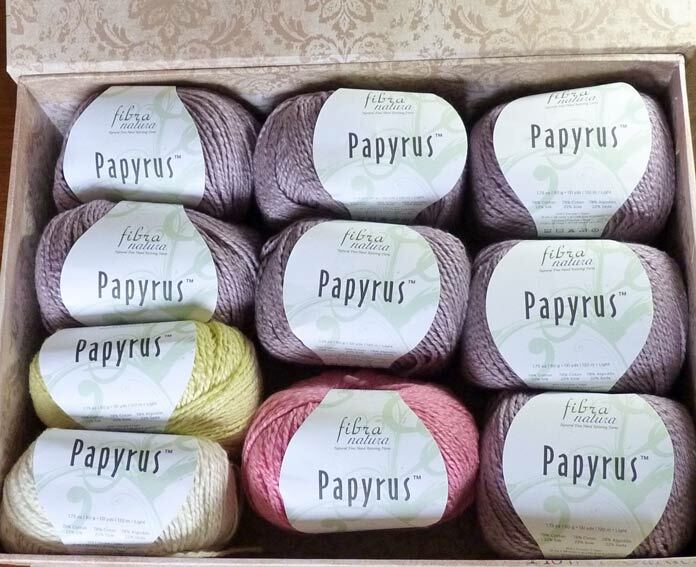 Naturally, with this knowledge in hand, and knowing that Papyrus is made of cotton and silk, and therefore offers a lovely drape, we can conjure up some fabulous summer knit ideas! My “first thought” use for Papyrus is the “office cardigan” – with 78% cotton, it’s cool enough to wear in the summer, and with 22% silk, it has enough warmth to ward off air conditioner drafts. The Babbling Brook cardigan is perfect for warding off air conditioning drafts, or for hiding spaghetti straps in an office setting. The Babbling Brook cardigan fills that bill nicely. It uses cables to mimic the appearance of water rushing over rocks in a brook bed. The link on the title of the pattern, above, takes you to a free pattern for this project, which is sized for Small right through 2X. The Graphite Tank is sized to fit a bust as small as 32″ [81cm] and as large as 56″ [143cm]. How pretty is this? There are enough colors of Papyrus to do this in blues, or even in the colors in the child’s tunic to come later in the week! I like the Graphite Tank so much, I’ve printed the pattern off to make for myself! For more casual wear, the Blissful Tee will fit the bill. This is a “true” T-shirt in that the sleeves are formed by adding stitches to the front and back at the underarms to make a “T” shape. No sleeves to sew in! 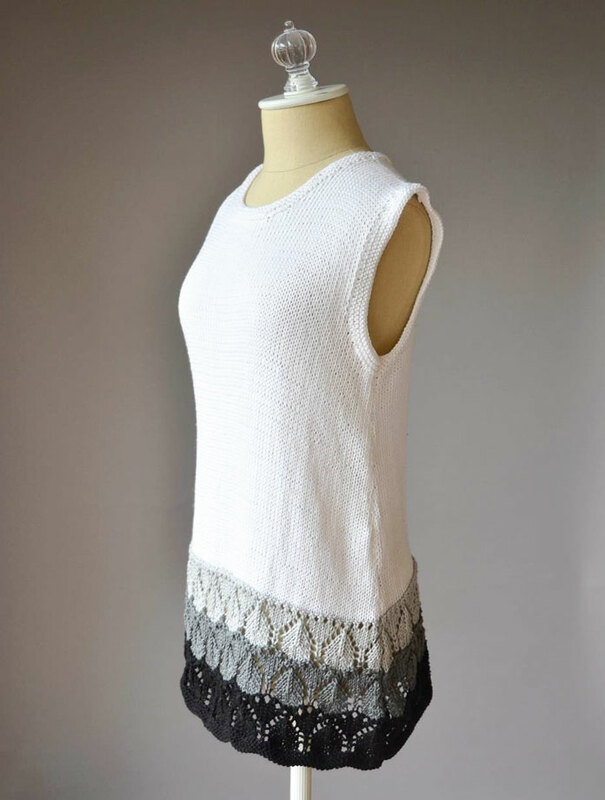 This little T-shirt would top off a summer skirt or a pair of jeans quite nicely! 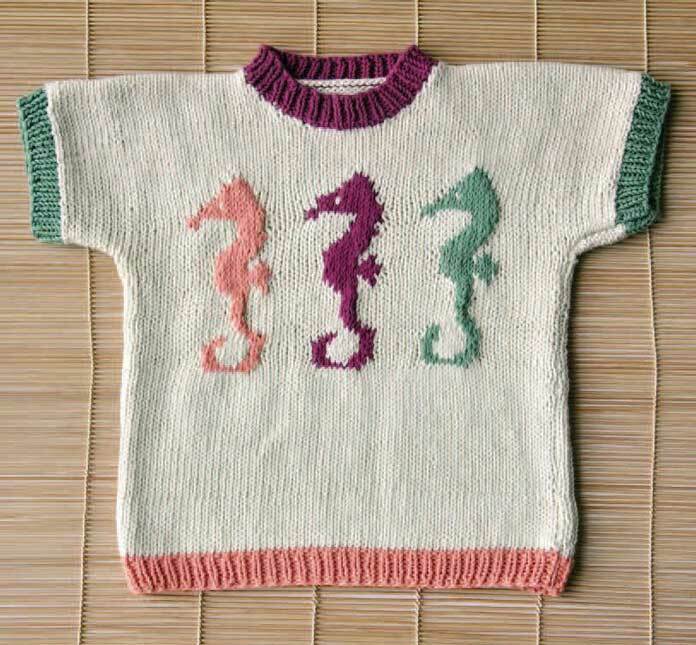 Our last project with Papyrus is the Seahorse Tee – even someone at the company commented on how precious this is! This little t-shirt would brighten any child’s day! 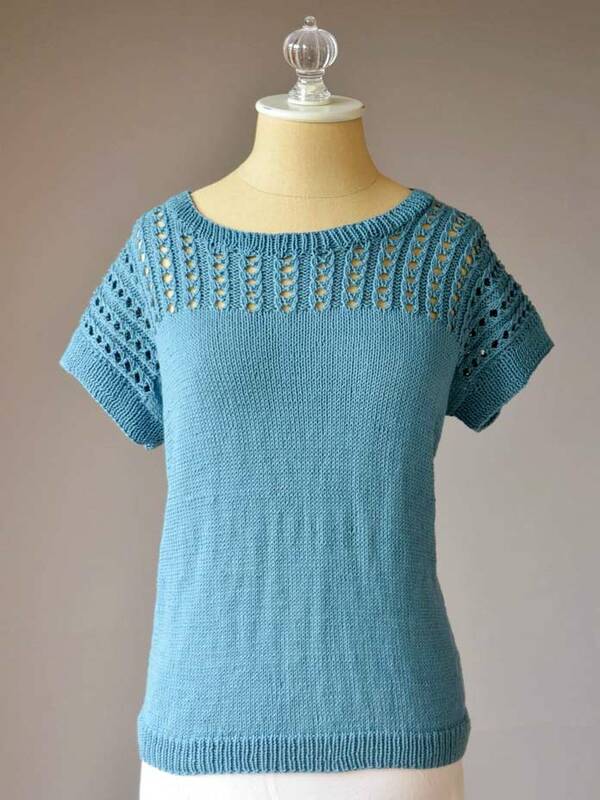 Like the Blissful Tee, this top has the sleeves added in as the front and back are knitted. The pattern gives instructions for sizes 2 through 10. All of these patterns are for double-knitting weight cotton yarns, and some of them have different gauges. For that reason, I recommend doing tension swatches, you may find my post from yesterday helpful in that regard. The Seahorse Tee is the perfect segue to my posts for the rest of the week. I’ve designed a child’s tank-tunic for sizes 12-18 months through size 4 in playful colors. I also go right through the pattern and explain various elements of patterns and why they might be written the way they are. Join me!